Today is the day y'all! 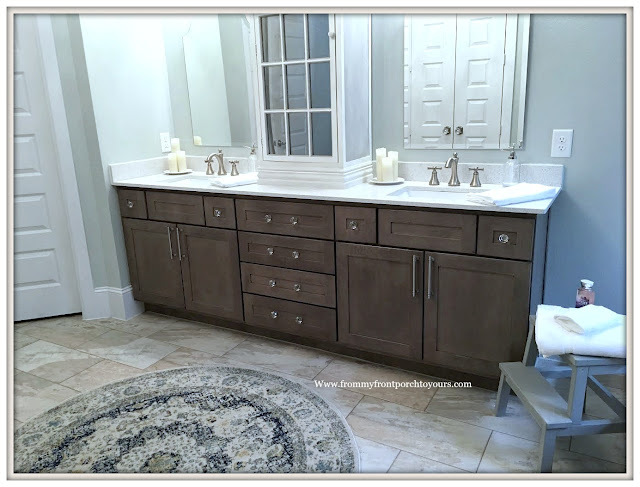 I am finally sharing our master bathroom makeover. It all began back in February when I started designing the space and thinking of how I wanted it to feel. As I shared previously before I began the makeover our master bath had some issues. You can read all about them and see more Before pics here if ya missed that post. Of course cabinet hardware was a must. Now that we have it installed I am not sure how we lived without it for almost a year and half. It was pretty easy to install and I was able to do it myself with just a little guidance from Mr. Front Porch. He hates installing hardware so he was more than happy to do the first one and let me do all the rest. It meant that if any of them were messed up it would be my fault and not his. LOL. 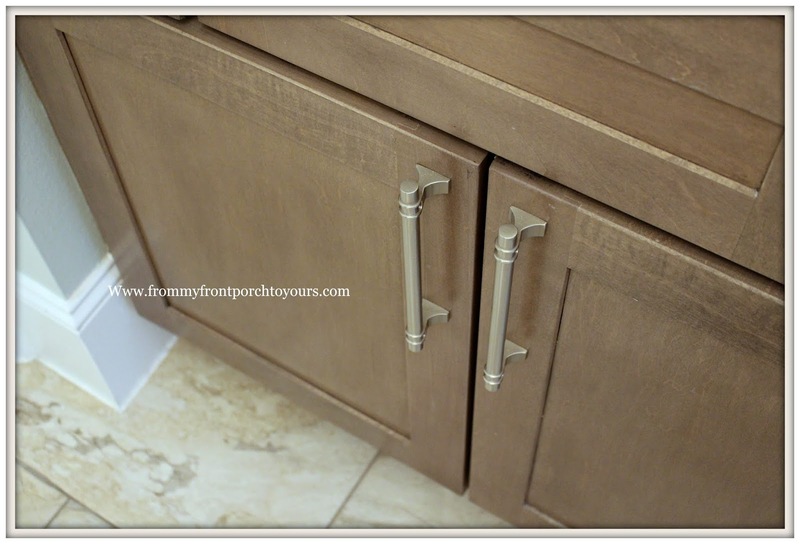 I went with 6 inch Amerock Davenport Satin Nickel cabinet pulls since they have a little bit of a masculine feel. I knew Mr. Front Porch would want something that wasn't all blinged out. LOL. 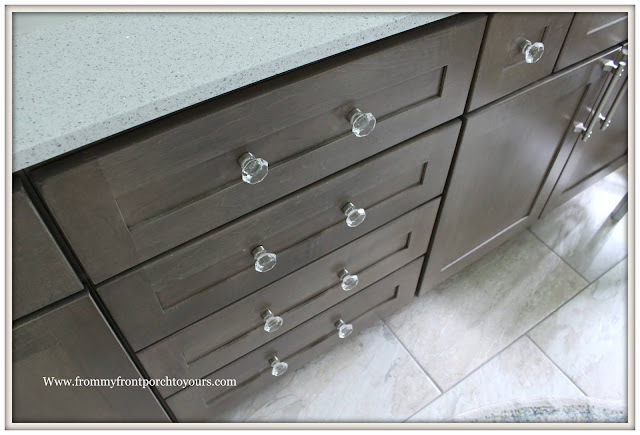 The Satin Nickel Crystal Knobs I had for over a year but we never installed them. I ended up using the ones I had on hand for our kitchen cabinets so I had to get some more for in the master bath. The Jessica McClintock Light Bars make such a statement. I took pics with lights on and off so you could see just how beautiful they are. Though these lights are beautiful I CAUTION anybody that orders them. They are extremely heavy so you will certainly need two people to install them. Also they were a MAJOR headache due to the fact that the first two I received came damaged. Between the two lights there were approximately 7 strands of crystals busted. They will send replacement strands but you would have to dismantle the light in three sections to even attempt to replace the crystal strands all the while not breaking any additional ones. Build. com ended up sending me out two new light bars and one of those had crystal strands broken as well. Though the customer service on the lights was excellent the lights themselves were a huge pain. If I had not had my heart set on the design and had not been hunting lights for over 6 months I would have returned them and found others. Just want to throw that out there in case anyone else loves the look of them as much as I do and ends up ordering them. Maybe you will luck up and not have any issues but I felt it is my duty to put that out there. The arched mirrors I ordered from Houzz and are called the Regal Frameless Mirror. Their shipping and product were spot on! I believe they come in two different sizes and these are the larger of the two. I had already ordered the mirrors when I happened upon this arched cabinet from Hobby Lobby. It received a makeover all its own. I wanted a piece that looked like it had a story to tell. I didn't want everything in the space to feel new. Antiquing the glass door I think put it over the top. It went from a cream color to a Paris Gray and white color story. I used Annie Sloan Chalk Paint to achieve this look and sealed it with my favorite Miss Mustardseed Clear Wax. 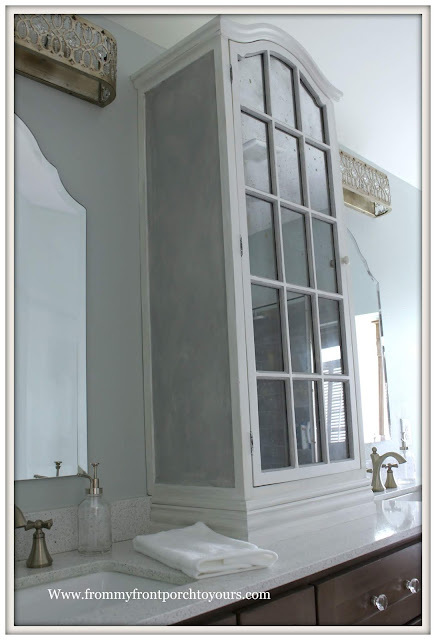 I order all my chalk paint and wax from Robyn Story Designs. She has the best pricing and the fastest shipping. I am beyond thrilled with how the space turned out! I painted the walls Sherwin Williams Sea Salt and it has such a calming effect.The bathroom is now one of my favorite spaces in our home. I was so excited to share with y'all and couldn't wait but I still have a small area that is in need of some attention. The tub area is a work in progress. I am mulling over ideas for the wall space and window. This little girl has picked out her favorite addition to the bathroom. LOL. She loves this rug to no end and heads straight to it whenever we come in here. It matches the much larger one I have in our master bedroom. I purchased it from Overstock and it is called the Safavieh Evoke if interested. 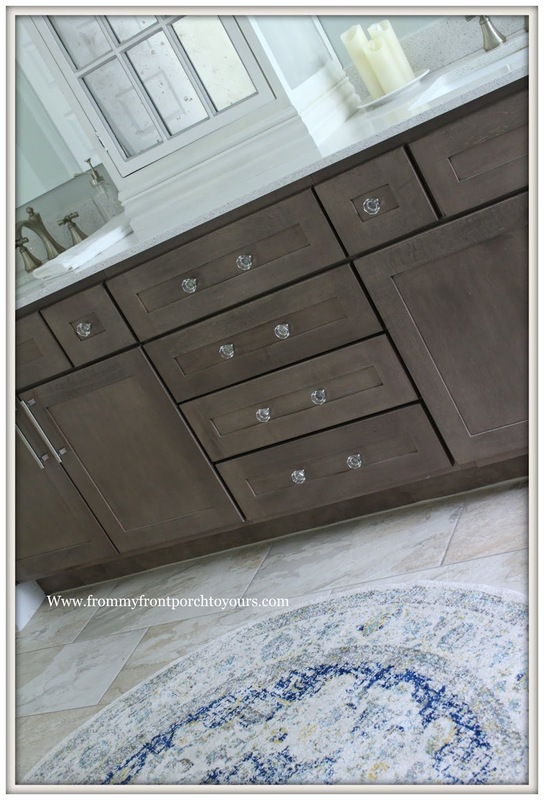 Many other retailers offer this rug but all of them call it something different but you may want to search for it just by the key words Safavieh blue and gray rug. Because many others offer it there is no telling who might've it at a better price. I research things to the cows come home before hitting the purchase button. It drives me crazy to find out I could have gotten something for less. Build.com provided me with ONLY the light bars and cabinet hardware for this makeover per my inquiry to them before I started this project. ALL opinions of the products provided are my OWN and only my OWN. All other items that I used for this makeover I purchased myself. Of course when completing a makeover it is always best to research for yourself what products you would like to use and their reviews. It's gorgeous! 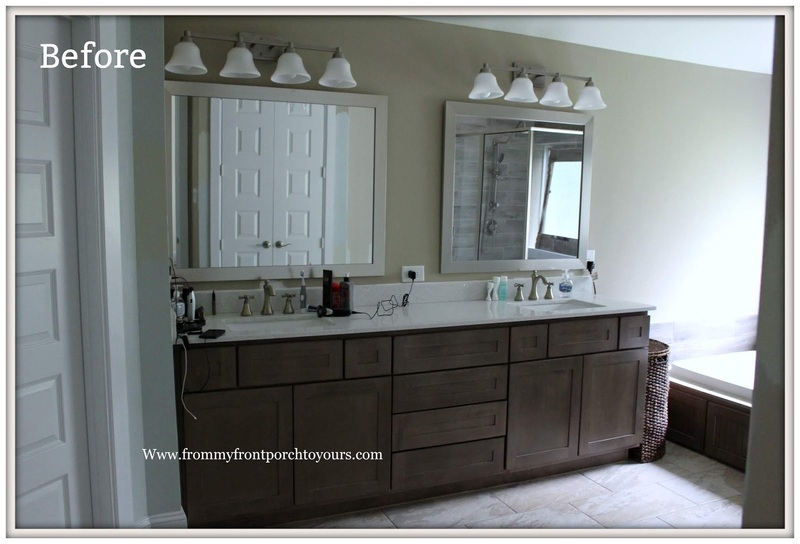 I can't believe the amazing transformations you've made in so many rooms already...LOVE them all! Thank you Kimberly my friend! As you know it has been a long road. Hugs! Pamela, this looks terrific. Only a discerning eye (one which paid for the install or one that has been through similar kinds of design headaches) would've really noticed all the before flaws you pointed out, but yea, those were pretty bad. What you've done looks super, super good. I sourced lights for my kitchen from Build and really appreciated working with them (and the price as compared to Ferguson's for what I was ordering - 1/3 the cost!). Truthfully, all those centering, height and measurement complaints you have with your builder's original install make me really appreciate my contractor's team when we remodeled our bath last year. They were so meticulous with placement and possible issues I didn't even think of (ones you've pointed out, like the outlet/mirror issue, the lights above, etc). Love your replacement decisions. The arches of the mirrors and cabinets - very nice. 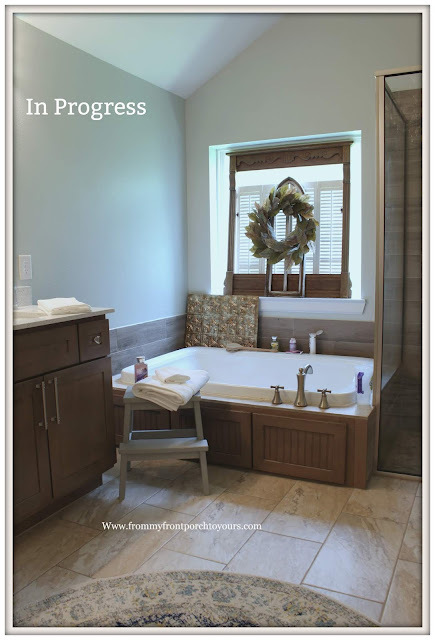 I have to say, I wanted a chandy and ended up without - too many issues with height over my tub and water ratings. But we did get the free-standing tub.....only after they had to reconfigure the piping from the ceiling below to connect it! Yes, the candy thing over the tub was such a hassle Rita but I am glad it worked out ok because I love having one just in the center of the room. Our supervisor was not detailed at all with our home even after we stated at the very beginning that we are very particular people. Hope you are enjoying your free standing tub. That is on the list down the line if we end up staying here for awhile. Thank you for stopping by my friend and visiting! Thank you so much Marty! Hope you have a wonderful week. I love it all, Pamela!! Great job. 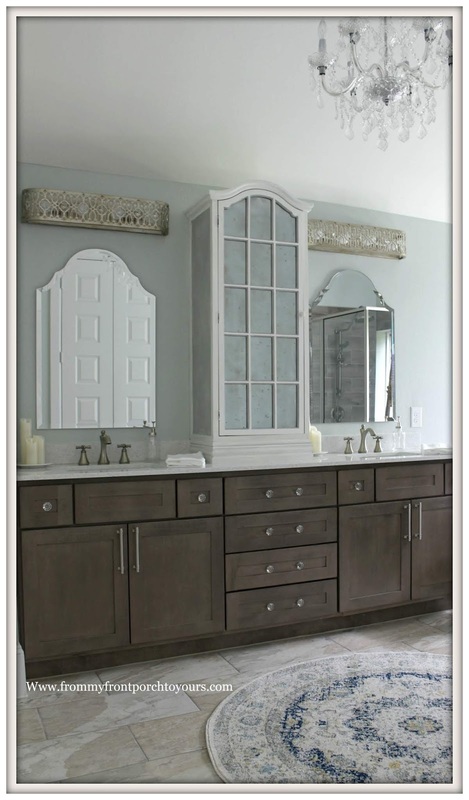 That arched cabinet between the mirrors is a showstopper. Enjoy your new space! Thank you Courtney! You are too kind. 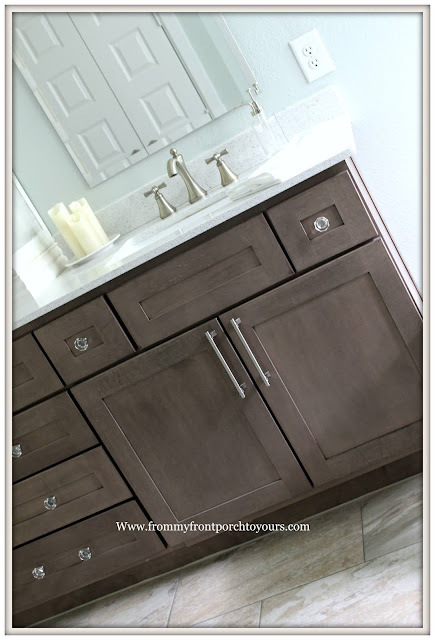 Part of me wishes we had white cabinets like your bathroom which I still love!Have a great week and thank you for stopping by to visit. Thank you so much Edna! Hope you have a great week. 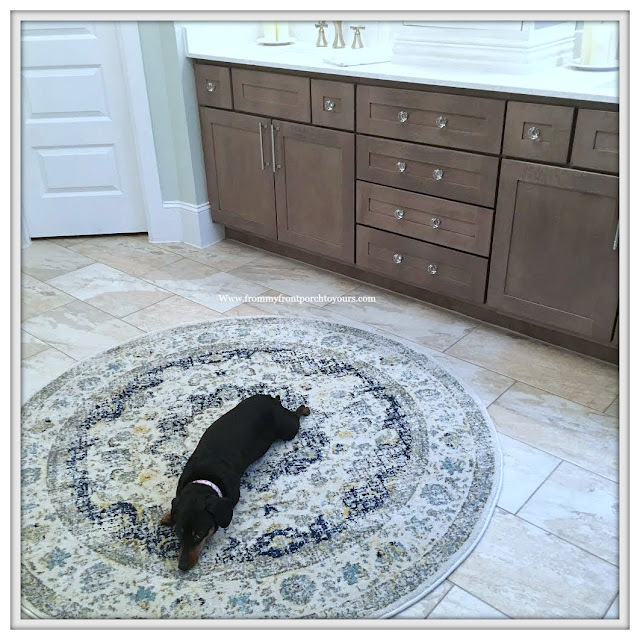 Looks great Pamela and you did a great job on that cabinet. Thanks Kim. I saved the feet so if we ever take it down then I can still use the cabinet. LOL. 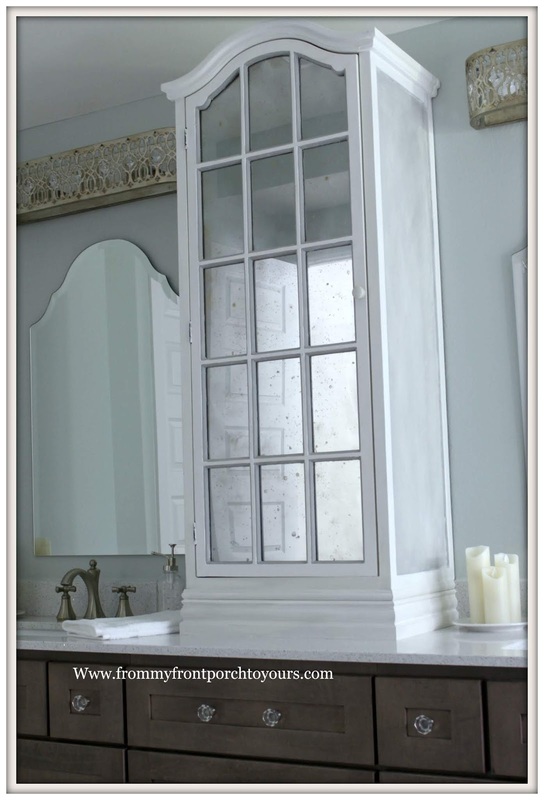 Pam, I am in love with your center cabinet with the antique mirror treatment that you gave it! What a difference the new lights, mirrors, and hardware make, too. It's all gorgeous! Thank you so much Jane! We are really enjoying the changes. 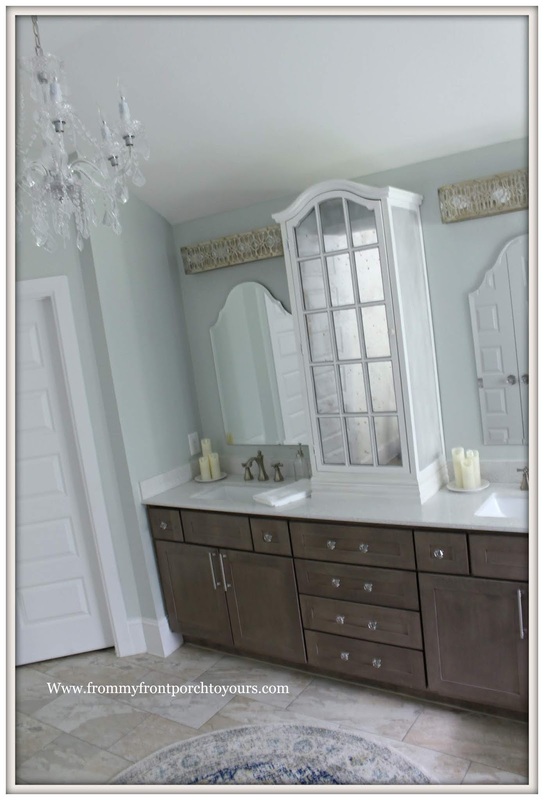 I love it Pamela.....the bathroom is beautiful and you did a great job on the cabinet!!! Thank you Shirley. Can't wait to see your new home. Congrats again on your new adventure my friend. Wow, Pamela, it is beautiful! 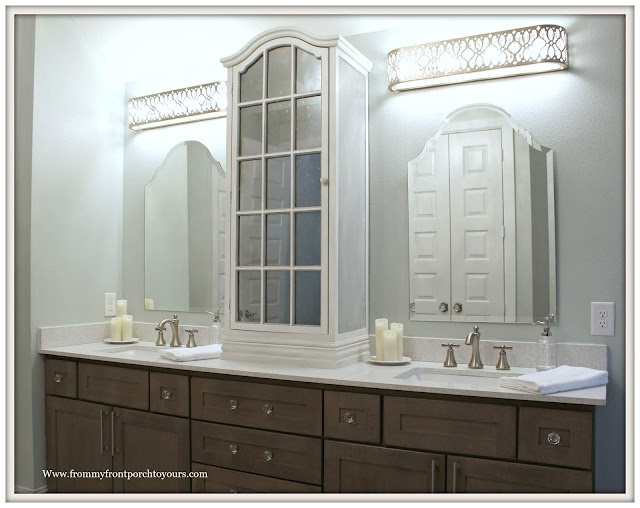 I love the idea of a cabinet between the two sinks and have been mulling that idea over...haven't mentioned it to The Man, yet! Oh you need to tell The Man you really need a center cabinet! We use it all the time. Thanks for stopping by to visit Carol and love your new hair color! Pamela, you have such vision! That cabinet and those lights are amazing! You found just the perfect combination of rustic and glamorous. Thank you Stacey. Hope you enjoyed the long holiday weekend. Man has it gotten hot steamy already! It looks beautiful, Pamela. I love the cabinet. The lights are gorgeous. Thank you so much Katie. Have a great week my friend. Pamela just stunning. Those lights are beautiful. Love love love it all. Great job. Your sweet fur baby is adorable too. I want to come and soak in that beautiful tub. Enjoy that pretty bathroom. I bet you smile every morning when you go in there. Happy Memorial Day. Thanks Kris! Yes, we enjoy our bath so much more now. Our girl has her special place and doesn't move when we are in there. LOL. Hope you have a wonderful week! It looks beautiful, Pamela! Love the arched cabinet.